No need for take-out with this homemade spicy kung pao chicken recipe with crunchy honey glazed walnuts! Thank you California Walnuts for sponsoring this post. Do you ever have one of those hectic days that all you want to do is order take-out? That daily grind sure can leave you fatigued, but creating a fast and flavorful meal for my family is one of my top priorities. Today I’m going to share with you a homemade version of restaurant-style kung pao chicken, made even cleaner. With simple, wholesome ingredients, you can recreate this popular recipe in 30 minutes! What takes this recipe to the next level? Well, you won’t get these crunchy honey glazed walnuts from your local Chinese restaurant. One bite and you will be instantly in love. The combination of savory, spicy and sweet chicken sauteed in fragrant sauces and spices is going to be a hit at your dinner table! Being a California native, I have a soft spot for walnuts grown locally. They add just the right crunchy and creamy texture that compliments any sweet or savory recipe. Walnuts have a light nutty flavor that is very versatile. I like to add them to a tasty pesto pasta or in a healthy snack. Walnuts not only taste good, but there are also some amazing nutritional advantages! Walnuts are the champion of plant-based omega-3 (alpha-linolenic acid or ALA) among nuts and are the only nut to provide a significant source of the nutrient (2.5 grams per ounce). In addition to omega-3 fatty acids, walnuts offer other essential components of a healthy diet, including 4 grams of protein and 2 grams of fiber per ounce. These nutrient-packed rock stars are a great addition to any dish. Instead of peanuts traditionally used in kung pao chicken recipes, I made honey glazed walnuts and sprinkled them with sesame seeds. It only takes a few minutes for the nuts to become coated with the caramelized honey, it’s so easy to make! They are so tasty and addicting. You can save some for a snack or top them on a salad. Yum! Making a stir-fry in a wok allows you to cook a complete protein and vegetable loaded meal in an instant! For this recipe, the chicken marinates in a simple soy and honey mixture to infuse flavors right into the meat before cooking. Fresh bell peppers are sauteed with fragrant garlic to enhance the aromatics of the dish. The cooked chicken and vegetables are then tossed in a savory sweet sauce and dried red chili peppers for a spicy kick! I intentionally made the recipe mild in heat, so that after tasting you can adjust the spice level based on your eaters. Some people like it hot, and if that’s you high five! Growing up in a big Asian family near Oakland China Town, we would just transfer the steaming hot wok of chicken to a platter so we can enjoy the meal family-style. However, if you’re feeling a little fancier, serve this with your favorite rice, quinoa or even cauliflower rice and generously top with the stir-fried kung pao chicken. Who’s ready to grab some chopsticks and dig in? The spiced chicken coated with savory sauce and topped with crunchy sweet walnuts satisfies all of your taste buds, big time! The best part of this dish is that it’s all made in one pan for a quick meal without all of the extra dishes. Flavorful, fast food, made right at home. It doesn’t get better than this! What other ways do you like to add walnuts to your dishes? I would love to hear your ideas in the comments section below, and let me know what you think about the recipe! Are you team spicy or team mild? What’s the technique for making honey glazed walnuts? Making candied nuts is all about using temperature to your advantage. As the honey glazed nuts are cooking, you will notice the liquid honey start to thicken. The moisture evaporates, and the color of the honey turns from golden to amber as the honey caramelizes. This process happens because Honey contains glucose, fructose, and amino acids in small amounts that help the honey darken and add more flavors compounds. Caramelization temperature typically occurs between 70 and 110 °C (158 and 230 °F). Make sure not to cook the walnuts past the amber color because they will burn. Adding a little bit of oil to the nuts when cooking prevents them from being as sticky once caramelized and cooled. 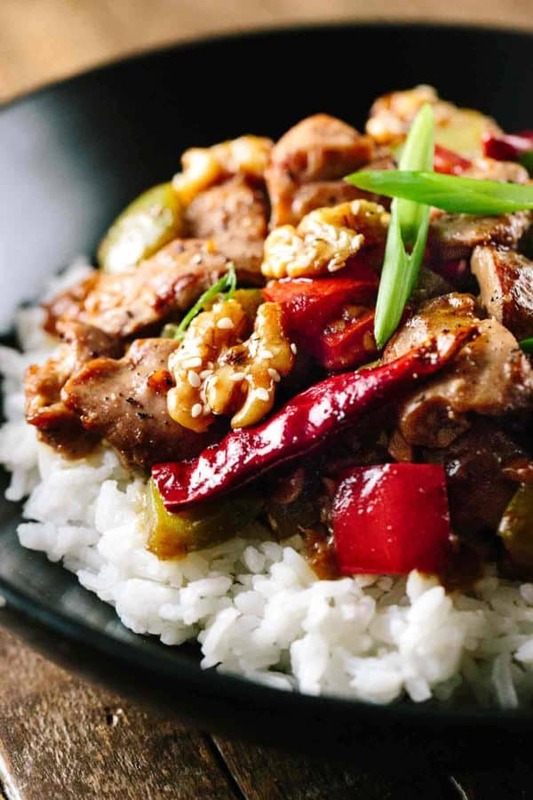 No need for take-out with this Kung Pao chicken with honey glazed walnuts recipe, get the meal you crave without all the extra fast food mystery ingredients. Add cut chicken into a large bowl. Add 1 teaspoon cornstarch, 1 tablespoon soy sauce, 1 teaspoon sesame oil, and 1 teaspoon honey. Stir to combine. Cover with plastic wrap and allow to sit at room temperature to marinate while you make the other parts of the dish. Line a small sheet pan with parchment paper or foil, set aside. Heat a medium sized pan over medium heat, nonstick recommended. Once the pan is hot, add 1 cup walnuts, 3 tablespoons honey, 1 teaspoon sesame seeds and 1 1/2 teaspoons vegetable oil. Stir and allow to cook for about 5 minutes, stirring every 30 seconds until the walnuts are glazed and honey is caramelized. Very little honey should be left in the pan. Once you see the color change to a light amber, turn off heat. Immediately transfer to the sheet pan and spread out evenly. Sprinkle a little more sesame seeds on top of each walnut. Once the nuts are cool, they will be slightly sticky but crunchy. Break up the pieces and set aside. Meanwhile, make the kung pao chicken. In a small bowl combine 1 tablespoon water, 2 teaspoons soy sauce, 1 tablespoon vinegar, 1 tablespoon honey, 1 teaspoon sesame oil and 2 teaspoons cornstarch. Set aside. Heat 1 tablespoon vegetable oil in a wok or pan with high sides until very hot. Add marinated chicken, spreading in an even layer and allow to cook for 1 minute. Cook for another 2 minutes, tossing and stirring continuously. The chicken should be cooked on the outside and slightly raw in the center. Transfer the cooked chicken to a clean bowl, set aside. Wipe down wok and add 2 tablespoons vegetable oil to the pan. When very hot, add diced bell peppers and cook, stirring continuously until brightly colored and just tender, about 1 minute. Push the bell peppers to the side and add minced garlic and ginger. Cook, frequently stirring until fragrant, about 30 seconds. Add chicken back to the wok, and stir to combine. Stir the sauce and then add to the wok. Stir and cook until sauce thickens, about 1 minute. Turn off heat, taste and add more salt, pepper and chili peppers as needed. Serve kung pao chicken with white or brown rice, quinoa or cauliflower rice. Divide chicken evenly in each bowl and top with crunchy honey glazed walnuts. Enjoy! 1) You can substitute the dried red chilies with 1/4 teaspoon crushed red chili flakes. 2) If you like your kung pao chicken spicy, add extra dried chili's however remove the seeds and roughly chop 1 or 2 and add to sauce. 3) Tamari (low sodium) can be used instead of soy sauce. If you use a regular soy sauce it may just be a little more salty. Oh yum Jessica. I sent it to my husband and said WHEN I GET HOME…….. In what step do you add the whole dry chilies? Aren’t they supposed to fry?. Thanks for your answer. This recipe looks good. Hi Candy! Step 3 right after you’re done stir-frying. However, if you like it spicy then you can definitely fry them earlier with the oil. Let me know how it goes!